Ted, the lucky Chihuahua! — Sport Horse Inc.
January 31, 2019 / Sport Horse Inc. Most of you that have been to the barn these past few days have noticed the absence of Ted and have heard the story that goes along with that absence. First, let me clarify that yes, Ted is still among us. He’s resting and healing, looking quite cute despite the un-fashionable collar he is required to wear temporarily. I’ve had a chance to think about the incident that has brought us to this point quite extensively over the past few days and no matter how I spin it, the fact of the matter remains that it could have so easily been prevented. After all, taking your leashed dog(s) on a walk at a horse show shouldn’t be an overly traumatizing experience… Unless you’ve been to USEF rated shows, with lots of horses that are brought by lots of horse people with lots of dogs. Loose dogs. EVERYWHERE. Would you believe that every single USEF rated show we’ve attended, at least one dog (or several) have “come after us”?! Thanks to my sharp ninja skills I have managed to keep the boys safe, until now. And it only took 5-6 seconds. That’s how long that English Bulldog had Ted’s ribcage in his jaws, shaking him like a rag doll. I have no doubt had Brian not intervened as aggressively and quickly as he did, Ted would have died from this incident. His injuries were severe, but he got lucky! All of his major organs were in tact and untouched by dog teeth. The pressure of the Bulldog jaws inflicted an abdominal hernia and a diaphragm hernia, entrapping his pancreas and partial small intestine. 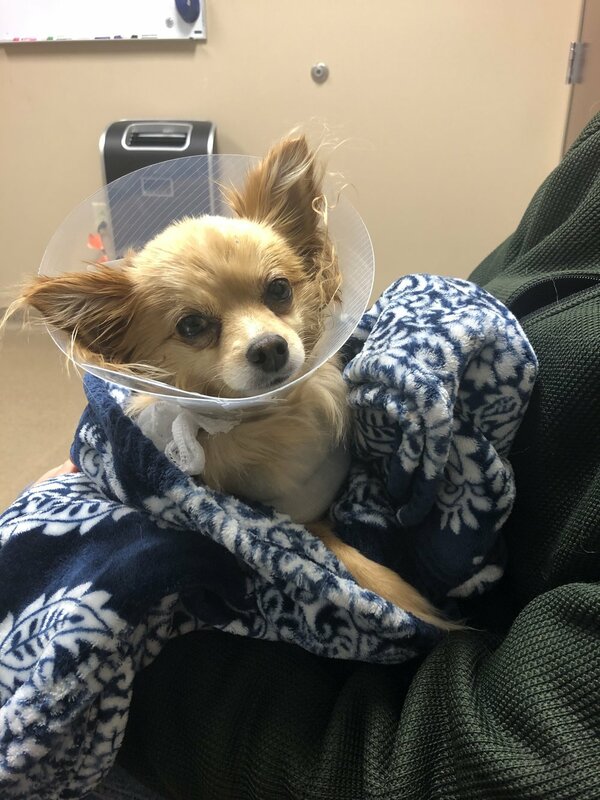 A huge SHOUT OUT to the Herrmann Vet Clinic staff for their quick assessment and the MedVET staff at Carmel, IN for their phenomenal job attempting to right all the trauma within this little boy’s body. He has been a stellar patient, recovering as well as we could have hoped for. Did I mention this could have been prevented??? Did I mention “Dogs are not permitted to be loose on competition grounds and must be held on a leash or otherwise restrained” per the USEF rules??? To say that this experience will have a lasting impact on our family is an understatement. Yes, we will be “those” people at horse shows. Those people who loose their cool and minds when we see loose dogs running around. Yes, we will take whatever action necessary to protect our dogs. Our dogs who are walking on a leash, attached to their owners, owners who take their responsibility of co-existing safely in a horse show environment seriously. Thank you to everyone who has contributed to Ted’s recovery, your well wishes and thoughts. He will be back, hopefully the same Ted he has always been!